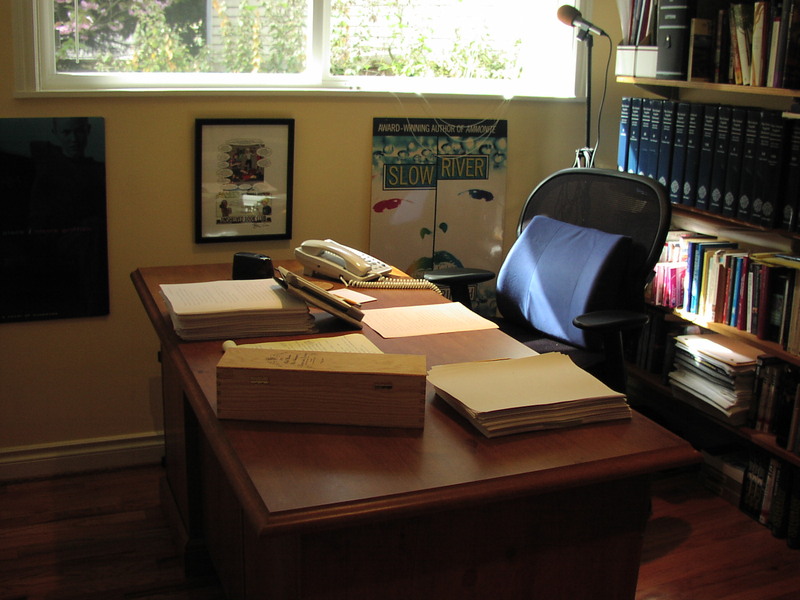 In May, when I finished my first draft of Hild, I tidied my office. I was so pleased with the result that I took some pictures. Once I had pictures, I felt the need to talk about it. (I’m a writer, not a photographer.) So here you go. I have two desks in my office. 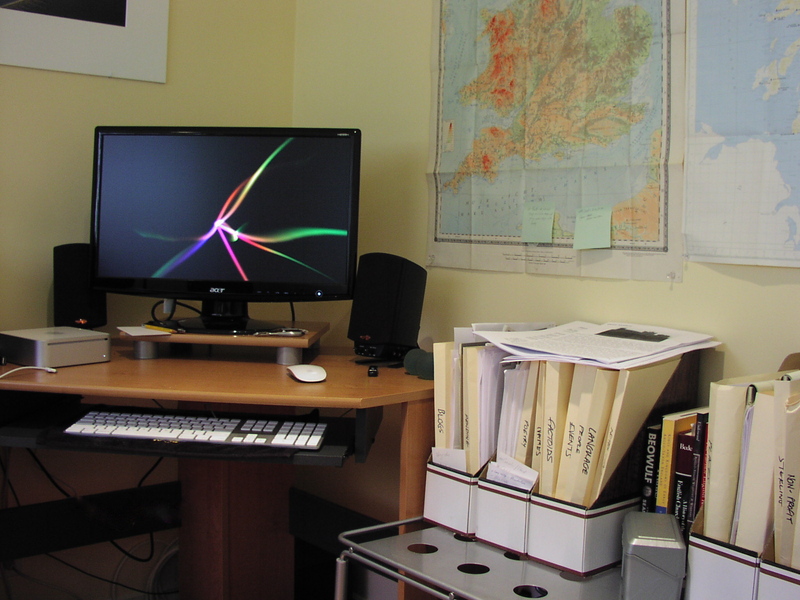 The corner desk is just big enough for keyboard, Mac Mini, speakers (Klipsch, with a humongous subwoofer hidden at my feet), and monitor (plus a pile of 3×5 index cards and a pencil). The theory is: keep it tiny and it won’t get cluttered. It works. Mostly. It’s at this desk that I write my first drafts, do my email, Tweet from boredom, and pump the volume so high rats flee the neighbourhood and mosquitoes fall down dead. Oh, and that black towel you see peeking out from beneath the keyboard? It’s a Don’t Panic towel, a HHGTTG promotional item. It’s too small to use as a towel, but it turns out to be a nifty keyboard pad (and handy reminder when the To Do list threatens to overwhelm the earth). On the wall next to it you can see a bit of the two-map set, Britain in the Dark Ages, south sheet on the left, north sheet on the right. We don’t call it the Dark Ages anymore, of course. It’s Late Antiquity, or Early Medieval, depending on the century. Hild’s time and place, seventh century Britain, is definitely EM. And I own it. That is, I own seventhcenturybritain.com, chortle. Expect some much niftier maps on that website. The big desk is where my first drafts gets turned into novels. There’s the first draft ms. of my current WIP: the first of three novels about Hild of Whitby (976 pages first draft; not many fewer in the third). A phone (rarely turned on; I hate—hatehatehate loathe and detest—talking on the phone). A pencil (and pencil sharpener—hate phones, love pencils): number 2, or HB as we say in the UK. To go with it: probably the biggest pencil box in the world, which started out life as a beautiful dovetailed, brass-bound presentation box for a 1973 Baron de Lustrac Armagnac (which I drank last year). You’ll also see a cork mat for my mugs of tea (Irish Breakfast, with a splash of 2% milk; couldn’t get anything done without tea and music—currently listening to my MainHild playlist, specifically “VargTimmen” by Hedningarna). The yellow legal pad is for my rewrite notes, usually jotted with a Pilot Precise V5, blue, extra fine. The problem with that (and fountain pens) is that when I spill my tea on my notes, the words all wash away. (When is the operative word here, not If. But I keep doing it.) That black thing leaning on part of the Hild ms. is my Kindle—one of the original batch, getting on for four years old now. Hild is so huge, so unwieldy in manuscript form that I uploaded it to my Kindle to read around the house. Problem: no page numbers, just location numbers, so when I have a note on the yellow pad saying This is boring, cut cut cut! or Oh, bloody hell, this is happening way too early! (both real examples) I have to figure out where it is in the printout. But the weird brain rubberyness I have to maintain to make it work seems to help. Pride of place on the bookshelves goes to the Oxford English Dictionary, which was my present to myself for my forthieth birthday. Possibly the best thing I ever bought myself. I know, you can access it online now if you have a library card—but what if the Big One actually happens, eh? What if there’s no more intarweb, no more handhelds? You’ll all be banging on my door bringing me drugs and beer and other valuables in exchange for a definition or two. Oh, yes. I plan ahead! Also peeking out behind the chair are a bunch o’ Ordnance Survey maps of the north of England, 1: 50,000 scale. You’ve no idea how useful they’ve been for Hild. On the wall you can see two styrofoam boards I stole from book signings. Between them is an exceedingly cool Unshelved review of Always. (My first and only cartoon-as-review. Why don’t more people do this?) In the corner is my microphone and stand—outdated now. Much easier to use a headset. But of great sentimental value. The window looks out onto our back garden. 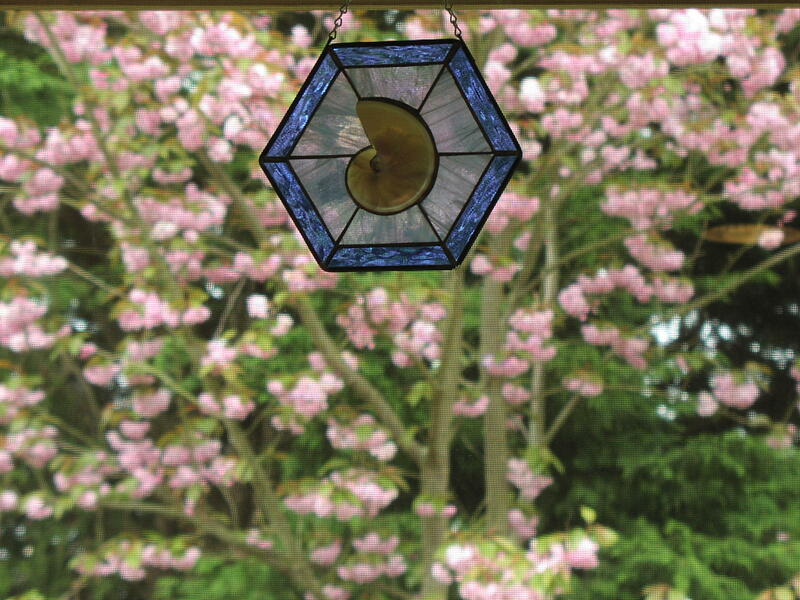 Here’s a closeup, complete with late blossom and the stained-glass-and-Chambered-Nautilus (it’s a real shell) dangly. So, there you go. Anything else you want to know about my workspace? So neat and comfy ! Does it mean you do your whole first draft on the computer ? And that you don't let yourself tweak it a bit here and there before it's complete ? Sylvie, when I'm working on a first draft, I tend to revise the pages I wrote the day before as a prelude to producing the next few pages. But not always. When I'm on a particularly hot streak, I just plough ahead. I make handwritten notes when I have ideas away from my office–when I wake up in the middle of the night, when I'm out of the house, over lunch, that kind of thing. Sometimes it's just a phrase to jog my memory when I'm at the keyboard later, sometimes it's a chunk of narrative, including dialogue. But, yep, essentially the first draft happens at my computer. Amy, you're welcome. I wrote Ammonite at the dining room table (we didn't have a kitchen big enough for a table…), so I hear you. I also use a Pilot Precise V5, blue, extra fine. Does that mean I'll write as well as you? Enjoyed having a quiet peek into your workspace. Do you have a link to the cartoon as review? Elaine, nah, it's not about the pen, it's about how much beer you drink. I write on a laptop placed upon a tv tray (pictures on my LJ). Which is just fine I think as I feel all that really matters is that I write.
. . . though a proper desk would be delightful since the closest thign I have to oen of those is hopelessly cluttered with books (Ammonite resting behind the camera case and directly underneath James Tiptree Jr's “Her Smoke Rose Up Forever”). BUT, I have been drinking a lot of beer. . . Which, the pocket calendar or the biro?